Wow, this years Aussie Millions has zipped past! We are pretty much on the home stretch and we’ve seen a bit of everything so far. 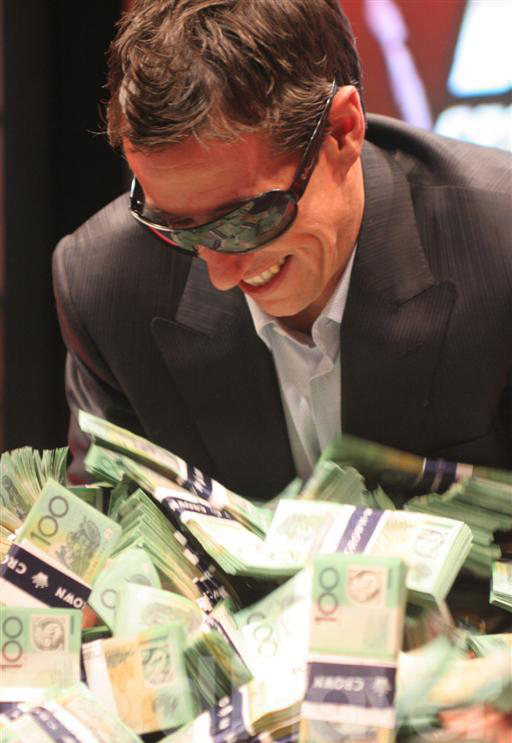 Stewart Scott became the first ever Australian winner of the biggest tournament outside of the United States, taking home $2,000,000 AUD and the coveted 2009 Aussie Millions Main Event Bracelet. All Aussie Poker congratulates Stewart on his life changing tournament win. At the moment we have a few events in the air. The first being Event #16 $10,200 AUD H.O.R.S.E - With a big buy-in mixed game event, we expected a stacked field and we got exactly that. Notable entrants include Tony G, Jeff Lisandro, Joe Hachem, Billy ‘The Croc’ Argyros, last years main event winner and Russian phenom Alexander Kostritsyn, Chris ‘Jesus’ Ferguson, Lee Nelson, WSOP Main Event Runner-up Ivan Demidov, Jeff Madsen, Gary Benson, Mel Judah, Michael Binger, Dan Shak and a few others. With plenty of action left in this one, stay tuned to see which big gun will own this title. Another event in play at the moment is Event #17 $1,100 No Limit Hold’em Turbo – Which had 159 players ante up for the speed title. Currently we are sitting with 30 players left in the tournament. But the only other event in play at the moment is probably the most anticipated as well. The $1 Million Cash Game. Right now we only have the 2 players battling it out, with Patrik Antonius and the arguably the hottest internet high stakes player Tom ‘Durrrr’ Dwan. With this format it’s basically whatever the players want, as this is a televised event, it’s most likely causing the producers a massive headache. Especially when players are requesting games other than the easy viewing of no limit hold’em. At the moment the 2 are playing 20 hands of No Limit Hold’em and then 20 hands of Pot Limit Omaha. But talk of mixed games have been mentioned. It’s called the $1 Million Cash Game, but that doesn’t mean players are restricted to $1 Million. Antonius came to the table first and brang with him a stack of various denominations of chips totally to $1,500,000 AUD. Dwan showed up about half an hour later topping his opponents entry to bring in for $2,000,000 AUD. Even though he has more money on the table, it’s Antonius who has the small edge winning a few 50k + pots, but nothing to dent the Dwan stack. Both players have spoken about how to recruit other players to the game. Dwan coming up with the idea of heading the super high rollers rooms and offering players $20,000 for playing 100 hands with them. While Antonius suggested offering a 20% rebate of any loss incurred while playing. Still no other players have arrived.